En is a small Japanese-style teahouse in the Gion area of Kyoto. You can enjoy an authentic tea ceremony experience first hand. of tea together with spirituality, history, architecture, the appreciation of handmade tea utensils. 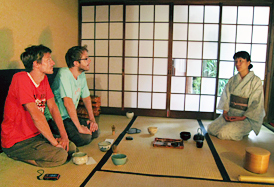 En offers a participatory introduction to Japanese tea ceremony for everyone to enjoy! 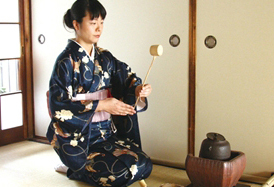 Know about tradition of tea ceremony. Each movements have meaning, enjoy a relaxed time! It’s different taste from normal leaves green tea, enjoy it! The word 'En' has important resonances to the Japanese people. The characters 縁 and 円, amongst many others, can both be pronounced 'en'. and is considered a very important concept. 円 means round or circle: a shape without corners, beginning or end. and of the highest truths of Zen Buddhism.